I was once assigned a reading at Georgetown that included a few passages in French without translation. I remember laughing with my roommate about the absurdity of expecting everyone to understand the reading. My roommate gave me loose translations since she studies French. On the other hand, the students in several of my classes at the University of Costa Rica have been assigned readings entirely in English when the professors can’t find Spanish translations. The double standard is immediately apparent: students in American universities would rebel at the idea of professors assigning entire readings in another language, but here it’s taken as a regular occurrence; the students complain a bit more and are less involved in the discussion, but certainly do the readings. Since the vast majority of my homework here is in Spanish (my second language), I am grateful for anything written in English to balance it out. However, the important difference between myself and the Costa Rican students is that I chose to leave the United States and come to another country to take classes in a different language, while the Costa Rican students chose to study in their home country. I’ve never really thought before about the privilege I have from growing up speaking English. Of course I understand that everything is much harder for people in the United States who don’t speak English or don’t speak it as their first language (even though English is not the official language of the United States). However, I’ve always assumed it would be similar to not speaking the major language in any other country. My study abroad experience has made me realize that this is absolutely untrue. English is spoken almost anywhere hoping to attract tourists, at least on a basic level. I was shocked at how many waiters, tour guides, and other people spoke English easily with my non-Spanish-speaking parents when they came to visit me last week. I’m proud of myself for learning and speaking as much Spanish as I do—I understand nearly everything in my college classes taught entirely in Spanish—but am only now understanding how many of my classmates have learned just as much English in order to survive and function in an English-dominated world, even in Costa Rica. For example, someone in my Political Economy class asked me about the only English word he hadn’t understood in our English reading: “canard,” which according to Google (I didn’t know either, so I looked it up) means either an unfounded/untrue story or a very specific aircraft part. The reasons why there is so much importance and privilege that go along with speaking English seem clear to me: British imperialism which originally brought English to new places, American political and military influence in many parts of the globe, whether invited or uninvited, and the current flow of English-speaking tourists. However, it’s less obvious to me why this privilege should continue. Although it’s useful to be able to communicate to some degree wherever I go, it shouldn’t be someone else’s job to learn English so I don’t have to learn their language. In fact, even in the United States, English has taken over enough to wipe out many Native American languages, a devastating cultural loss. Meanwhile in Latin America, indigenous people often learn Spanish as a second language and then have to tackle English as a third. It’s not just speaking English that’s a unique and important opportunity. Learning other languages at all can be more or less of a challenge depending on many factors. For example, while I speak English, Spanish, Dutch, and Arabic to varying degrees, it’s because I’ve had the chance and the time to learn them. Spanish was offered at my high school, and I had a very good teacher. Other schools may not have the same level of language instruction, or alternately may begin teaching languages in elementary school to give kids the best chance of understanding them. My family was able to buy computer programs to help me learn Dutch and encouraged me to learn, especially since two of my grandparents are Dutch immigrants. Finally, going to college and participation in study abroad programs are certainly experiences that not everyone can achieve. My host siblings here and in Jordan have been learning English thanks to their parents enrolling them in private schools so they have good opportunities. Even so, their experiences depend on the teachers they have. 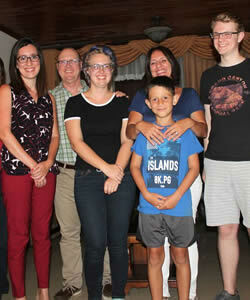 However, despite the importance of language for cross-cultural communication, one of my favorite experiences in Costa Rica was when my mostly English-speaking family visited my mostly Spanish-speaking host family, and we all sat around and enjoyed dinner together. Sometimes, despite the barriers, language doesn’t matter as much for communication as smiles and kindness.